Wa-a-ay back in 2003, when TO FLY won all those literary awards, I was invited to make author visits to schools and libraries like crazy. 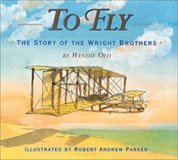 But I never knew how to respond to the joyful teachers and students who said they loved my book, as they pointed to a poster on the wall advertising that other guy's Wright brothers' book -- you know, the one that won the $10,000 James Madison award. Lisa Yee did a wonderful post on her blog some time ago about the time she showed up for a booksigning, only to discover all the books on her booksigning table were books by a Lisa SEE! Here is a link to Lisa Yee's wonderful blog. I'm sorry that I couldn't find the exact post about her author mix-up (I've spent too much time trying to find it--and I simply can't), but enjoy viewing her blog anyway. 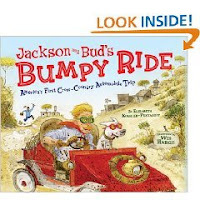 Jackson and Bud's Bumpy Ride, America's First Cross-Country Automobile Trip by Elizabeth Koehler-Pentacoff. Illustrated by Wes Hargis. Mineapolis, MN: Millbrooke Press, 2009. Available now. I spent the last part of the 20th Century researching the December 1903 First Flight of a heavier-than-air flying machine. Imagine my surprise when I discovered that 1903 was also the year of the first trans-continental automobile trip. Automobiles had recently been invented, but were still the toys of the rich. Most people still walked, rode bicycles, horses, or horse and wagons (or carriages) to get from one place to another. At one point the text says "Next day," (June 6) -- but on the previous page it was still mid-May. Skipping along (eliminating the boring parts? ), one page has four quick paragraphs about June 23 -- and the facing page of the double page spread talks about July 7. Turn the page and it's July 12 where they drive through a huge swarm of grasshoppers. This tiny taste of Jackson's adventurous trip leaves you wanting to know more. Luckily others (mentioned in the back of the book) have written longer, more detailed versions. There even was a Ken Burns PBS Special shown in 2003 about this cross-country trip -- not actually a race, since they knew of no one racing against them. However, it turned out that two other driving teams also attempted this feat that summer -- but Jackson, his co-driver Cocker, and Bud arrived first. 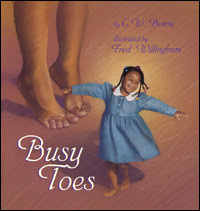 More Nonfiction Monday reviews can be found here. Life during May has been, and is, busy - busy. 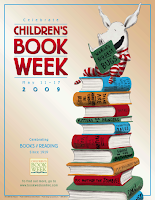 Besides the ongoing project of tagging all the library books with RFID tags, it's also the season for children's librarians to go out and visit the local schools, telling all the students about the Summer Reading Programs at the public libraries. After talking to 8 groups, I came back to the library branch today and sat down at my office computer to type up a list of the books I talked about -- to be stored in the library and a copy sent to the school. BUT, I discovered that my computer had decided that it no longer wanted to talk to the network. I wanted to get those books out on display before school let out -- because I always tell the kids that the first ones to get to the library will be able to check them out. The rest will have to put a reserve on the title and we'll get copies from another branch for them. I always grab interesting new items (a Playaway/ a book in a round format) -- nonfiction as well as fiction to take to the schools. I have to admit, I heard the same lecture at Vermont that the 'Through the Tollbooth' writers did (or else that faculty member uses this example every few years) and I heard the sound of over a hundred writers gasping. Maybe it was just my own intake of breath, but it seemed loud -- as if the whole room had done it. Are you certain you will remember enough of what you wrote to be able to recreate it? If you delete it -- it's gone -- For-ev-er. And yet, how many times have you been unable to find a file and had to recreate what you had done? Woke up in the middle of the night with a thought/ wrote it down/ and were unable to read it in the morning? You had to recreate it. Did you decide that your second try might have been a tiny bit better than your first attempt? And, since you weren't locked into that first version, you were free to improve/ expand/ etc. Are you brave enough to jump off a cliff? The writers over at theTollbooth blog talk today about jumping off a cliff -- completing the first draft of a novel and then -- hit the delete button and begin writing it all over again. If you have tried this, did you discover that the second version was stronger/ tighter/ a better story? Labels: delete and start over, Jump off a cliff, writing. What to Do About Alice? How Alice Roosevelt broke the rules, charmed the world and drove her father Teddy crazy! 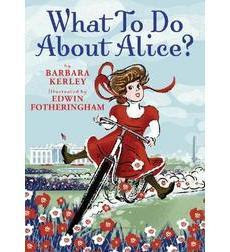 by Barbara Kerley, illustrated by Edwin Fotheringham. New York: Scholastic, 2008. Available now. Obama family -- move over. Children in the White House aren't anything new. Teddy Roosevelt, who became president in 1901, had six children. His oldest child, Alice (the only daughter of his first wife), was a handful. Perhaps because she was the oldest. Perhaps because she was a teenager, kicking over the traces. But most likely because she simply had an unconquerable zest for life. Alice's super energy jumps from the pages -- conveyed both by the exuberant writing AND by the energetic illustrations. Other Nonfiction Monday reviews are here. The 9-year old had her piano recital today. Hurrah! It went well and now we can relax a bit. Since she chose the May recital rather than the June one, I warned her that she was in for several intense weeks of practicing. She even skipped her gymnastic class so that she could get an extra practice in. She's so frustrated. She creates new pieces of music, but doesn't have the knowledge to be able to write it down. This year her created music is technically more intricate than last year's. See -- I told her -- the more you know about playing piano, the better your composition is. Her other frustration is that she wants to add things to her assigned pieces, "because they sound better that way." True, they do sound better that way, but we insisted she play the pieces as written for the recital. Well, did you make it? 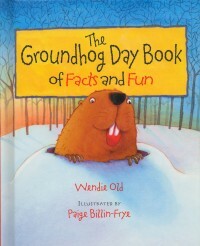 Did you write seven picture books in seven days. They didn't have to be complete. They didn't have to be good. They just had to be different -- one a day. They could be short. 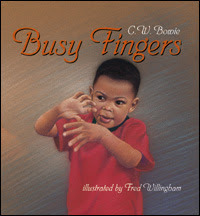 Look at my 'Busy' Books -- about 90 words (Fingers is longer) and still best sellers for my publisher. They could be long -- over a thousand words. To Fly is over 3,000 words. Did you follow along with the encouraging posts at The Three Silly Chicks' blog? Or did you keep up with what everyone else was doing at Paula Yoo's blog? Now, of course comes the hard part -- REVISION -- where you get to take this core of a story and build a picture book around it.